Animals have adapted to live in different environments and eat different foods, so they don't have to compete with each other. These four groups don't have a common ancestor who could fly. In fact, they all evolved to fly from ancestors who could not. This is what we call "convergent evolution". The bat ancestor (or pre-bat) lived in trees, hunting small insects as they moved along the bark. Since it's much harder to run up a tree chasing an insect, the pre-bat would wait, facing downwards for prey to come up the tree trunk. That way they could easily run downwards if they saw something tasty. They used their hands and mouth to grab the prey and hung from their back legs. This led to an adaptation in their claws which allowed their tendons to lock into place when they hang. That's why bats can hang upside down without using muscles, and barely any energy. Gravity does all of the work for them. Since it uses the least amount of energy, it's the best way for a bat to sleep. 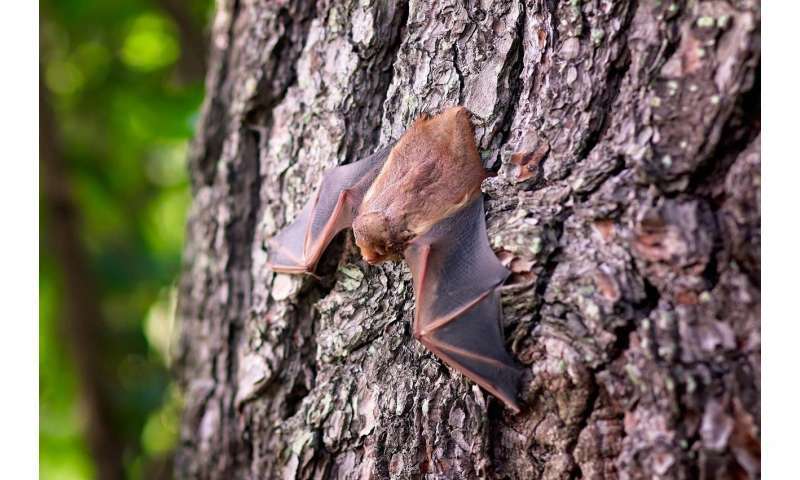 But on the trunk of a tree, they are visible to predators who hunt during the day while bats are sleeping. Some bats moved to sleep under the horizontal branches, which provided protection. When you watch a bird take off from the ground, you will notice they need a run-up. In order to get off the ground, flying animals needs to achieve what scientists call "lift" to overcome gravity. Many big birds, and bats, do not have strong enough wing muscles to generate the lift required to take off from a standing position (like a helicopter can). Did you know there are seven species of bats that do not sleep upside down?They sleep in curled-up leaves! Six of these species live in Central and South America, while the other one lives only in Madagascar.